At Triple J Produce, Inc. we are constantly making sure we stay compliant with Food Safety Regulations. We carry certification from GlobalG.A.P. for our Conventional produce. ICS certifies our Organics. We have a great team in place to help cover every aspect to make sure our produce and facility stay compliant. 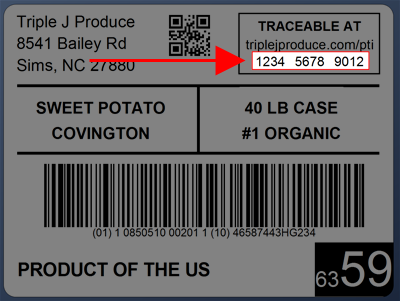 Triple J Produce, Inc. is also PTI compliant and are able to trace from harvest to delivery. Every case we ship will have our PTI sticker, which you are able to scan with a smart phone and see our response page. You may also trace each case by entering the 12 digit code found on the PTI sticker (shown highlighted below) on our PTI lookup page. © Copyright 2019 Triple J Produce. All Rights Reserved. Website Design & Development by Gibbs Design, Inc.